Welcome to Uncyclopedia, Superb Owl Sunday edition!, the future Hall-of-Famer that Peyton Manning still can't edit. Jerome Bettis has inspired us to work on 46,143 articles since opening in January 2005. 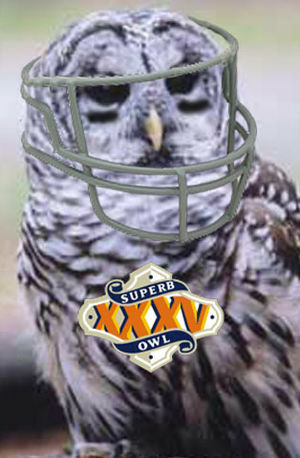 Mike Holmgren has posted his XL Superb Owl gameplan for both teams to read before the game. ... that Bill Cowher isn't actually that fireman that saved you, ma'am? ... that Peyton Manning knows Terrell Owens is the REAL reason he's not playing Today? ...that if we used a language without homonyms, a certain type of pun would be impossible, and thereby much gaiety would be lost? Congratulations to Rcmurphy, this year's Most Valuable Player!